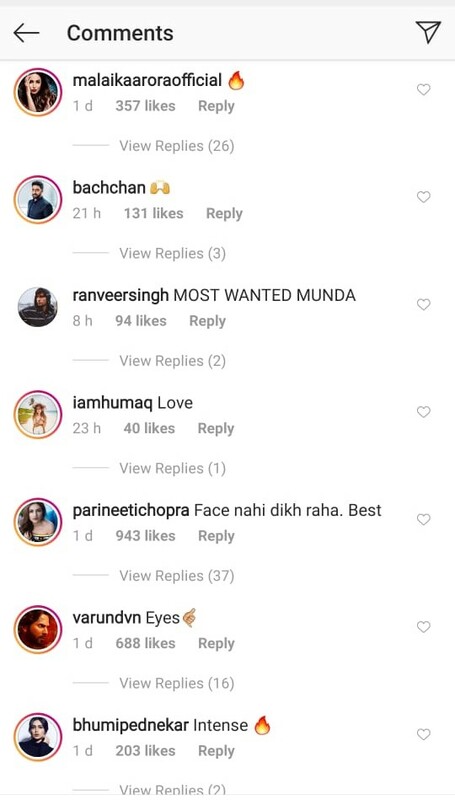 The actor's next film India's Most Wanted poster was out today and Arjun Kapoor took to social media to share the same. Arjun Kapoor in India's Most Wanted. Arjun Kapoor is beginning 2019 with powerful performance. The actor's next film India's Most Wanted poster was out today and the actor took to social media to share the same. The film revolves around the heroics of 5 unsung men who hunted down India's Osama without firing a bullet. Inspired by true events, Arjun shared the poster and wrote, "am proud to present to all of you #IndiasMostWanted, an unbelievable story inspired by true events. Teaser out tomorrow. @rajkumargupta08 @foxstarhindi #RaapchikFilms #IMW." Comments soon poured in from his colleagues and friends including his rumoured girlfriend Malaika Arora. She dropped the fire emoji on the picture. Apart from Malaika, Parineeti Chopra also commented on the actor's post and said, ""Face nahi dikh raha. Best." Varun Dhawan also has commented "eyes," along with an emoji. Arjun's bestie Ranveer Singh as usual had the most quirky comment of all and said, "Most Wanted Munda." Take a look below at all the comments. last time Arjun was in a decent movie was 2 states that was 5 years ago, not sure why this lazy person keeps getting roles. becoz iska baap producer hai&he belongs to a filmy family..when the flops keep on piling like abhishek..he will stop getting movies just a matter of time.